Considering this out-of-sight yard drainage option could save your property (and your neighbor's) from erosion after every storm. 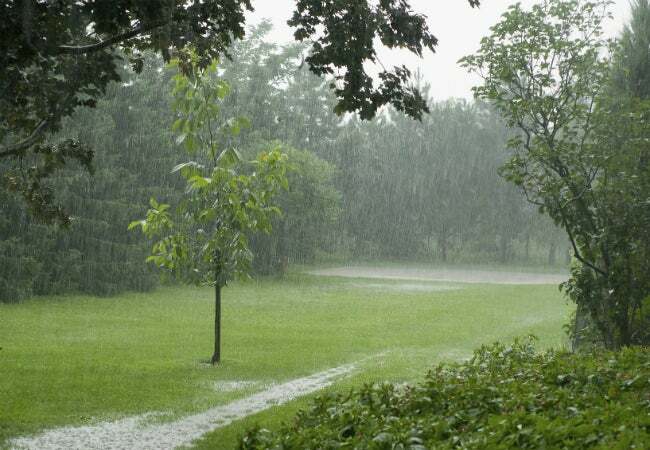 If storm water races from your yard and across the next lawn over after every heavy rain—washing out a flowerbed and cutting a ditch along the way—you could probably expect a knock on the door from one very disgruntled neighbor. But neighbor issues would be the least of your problems. With uncontrolled storm water, you can expect erosion and localized flooding time and time again. Dry wells are just one means by which homeowners can collect and control storm water runoff. They are not suitable for everyone, however, so read on to determine if it’s the best drainage solution for your yard. Imagine a large paved parking lot. Before the parking lot was there, falling rain soaked evenly into the soil. Now when it rains, the water can no longer drain, so it runs to the lowest area on the parking lot. Before long, water pools, and—if the developer did not make provisions to divert the water in a controlled manner—it will run over the curb and erode the soil beyond. The same principle is at work in your own yard: Rain falls on your roof, drains to the gutters, and then rushes out of the downspouts to wherever it can drain in the soil. Even water from a gentle rain can build up force as it exits the downspouts. That’s where a dry well comes in. A successful installation harnesses gravity to direct water toward the lowest point in the yard, where a dry well has been buried. This gives runoff water a place to collect until it gradually dissipates into the soil, instead of cascading across the lawn surface and pooling in depressed areas. Note that while dry wells typically collect runoff from the roof, they can also be used to relocate gray water (the relatively clean water wasted by sinks, baths, washing machines, and dishwashers). Is a Dry Wall Right for Your Property? In some developments, homeowners may be required to install one or more dry wells to reduce the impact on municipal storm drains. If dry wells aren’t mandated where you live, you can use soil testing along with advice from your local building authority to help determine whether a dry well would help your setup. The most important factor in determining whether your yard could benefit from this in-ground installation is your soil’s infiltration rate, or how quickly water can be completely absorbed into soil. To calculate this rate, you’ll conduct a percolation (perc) test in your yard—a process that involves digging a hole (or numerous holes), filling them with water, and then recording the rate at which the water seeps into the ground. Detailed instructions for performing a perc test on your own property are available from your local extension office. A spot where the water drains away quickly might be a good candidate for a dry well; while homeowners who have heavy clay soil on the property and slower drainage will likely need to find a different option for moving storm water. If local ordinances do not regulate the size and number of dry wells, it’s standard practice to install one for each downspout. Additional dry wells may be necessary if elements of your landscape are creating a drainage problem, such as runoff from a driveway or large patio. Ideally, dry wells should be large enough to collect runoff without overflowing in typical rain events. Depending on the average amount of storm water you need to control, you can choose install a dry well that’s as small as a couple feet in depth and diameter or as large as several feet wide and several feet deep. The type of dry well you choose to install can vary greatly depending on the amount you’re looking to invest. They run the gamut from inexpensive hand-dug pits lined with permeable landscape fabric and packed with rocks to high-end perforated concrete or polyethylene tanks. No matter style what you choose, you can cover a dry well with turf for camouflage or an open grate for easy monitoring. Assuming your soil passed a perc test, you’ll want to position a dry well or two on storm water’s natural drainage path through your yard—but keeping a safe distance from your home’s foundation, no shorter than 12 feet. To keep the water from cutting a rut after it leaves the downspout, you can install a simple swale (a trench filled with gravel) leading to the collection pit or a buried French drain that is undetectable from the surface of your yard. Your project should also include provisions for dispersing excess water that occurs during rain events that cause your dry well to overflow, such as an overflow pipe that leads to a storm sewer. Call DigSafe at (811) to find the location of buried utilities before digging, and contact your local building authority to see if you need a permit. Installing a dry well can be a DIY project, but it’s also a relatively quick job for a professional landscaping contractor. Many dry wells function for years without problems, but sometimes sediment and debris washed along with runoff can clog the pit walls and reduce the dry well’s ability to disperse water. Alas, the only remedy for a clogged dry well is re-excavating and repacking the pit. 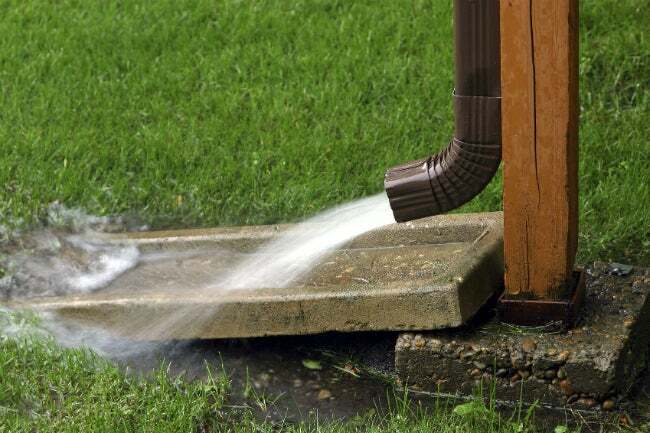 Before you even encounter such a hassle of a problem, however, you can help prolong the useful life of your dry well by regularly cleaning gutters and down spouts to eliminate grime and debris early on—before they even reach the pit. If you’re using a dry well for gray water, install a filter on the drain line and clean it frequently to remove lint and soap scum that might otherwise clog it.